Synopsis: After a harsh childhood, orphan Jane Eyre is hired by Edward Rochester, the brooding lord of a mysterious manor house to care for his young daughter. 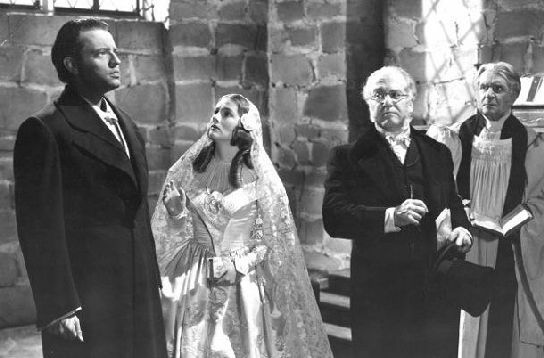 Despite a tendency to lapse into melodrama on occasion, Robert Stevenson’s 1943 version of Jane Eyre – the seventh of eleven made for the big screen to date – is a shining example of Hollywood artistry and professionalism from an age when commercial consideration didn’t necessarily preclude a studio from tackling classical literature. Jane Eyre is a fiery young girl (played with an infectious spirit by little Peggy Ann Garner – Black Widow – who, while not one of Hollywood’s prettiest child stars, was certainly one of its most capable) who discovers, upon escaping from the oppressive regime of her guardian, Mrs. Reed (Agnes Moorehead – The Magnificent Ambersons), that she has leaped from the proverbial frying pan and into the fire. Mr Brocklehurst (Henry Daniell – The Great Dictator), the proprietor of a school for orphans, is a firebrand who earmarks Jane for special treatment because of her rebellious nature, thus ensuring her formative years are spent in an atmosphere of cruelty and oppression. Her only friend at the school (an uncredited 11-year-old Elizabeth Taylor) dies as a result of Brocklehurst’s puritanical cruelty, but nobody seems to have the power to bring him down, so Jane grows to womanhood under his stern and unyielding guardianship. The film insists on portraying the fully-grown Jane as something of a wallflower, even though the role is assumed by Joan Fontaine (Rebecca) who, while maybe not the most glamorous of Hollywood actresses, was far from plain, a fact which is highlighted by Stevenson’s tendency to spoil her with an overabundance of extreme close-ups throughout the movie. Anyway, although Jane has remained at Brocklehurst’s school for ten long years, she hasn’t lost her independent streak, and refuses an offer of employment within the school to take up a position as governess to a young girl at nearby Thornfield Hall. The sheer silliness of that secret is one that has the power to derail any film version of Charlotte Bronte’s novel, and it comes pretty close to doing so here, but the conviction of Welles and Fontaine, strongly supported by the likes of Daniell and Moorehead, and the atmospheric confines of the Rochester house – all stout stone walls and passageways – in which much of the story takes place just about manage to overshadow the near-fatal implausibility of its final act. It’s a close call, though, and the more pragmatic viewer might find making it to the final credits something of a trial.